The fields of genetics and molecular biology are able to provide strong evidence for evolution. All organisms on Earth are composed of the same building blocks: DNA, RNA, and proteins. DNA and RNA are composed of specific sequences of nucleic acids that are inherited through generations. Protein is composed of specific sequences of amino acids encoded by the sequence of nucleic acids in RNA. If two species are closely related, they have very similar molecular sequences. The longer that they have been evolving as separate species, the more likely that they will have undergone genetic mutations that make their DNA sequences less similar. 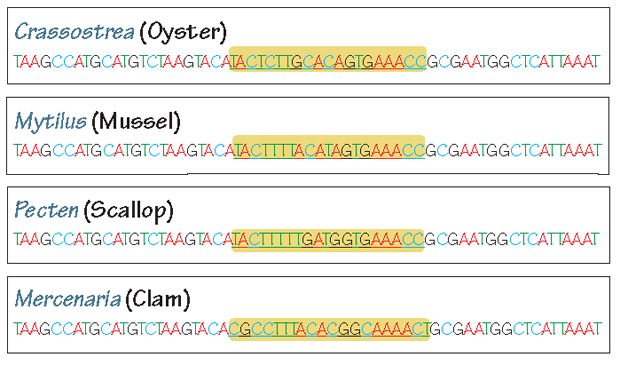 Isolating and sequencing DNA and RNA from living organisms, such as a bivalve, is relatively simple chemistry in today’s molecular laboratories. Click here to learn the basic procedure. Unfortunately, it is very difficult to isolate DNA or protein from fossils. Soft tissues have been recovered (most famously in the dinosaur Tyrannosaurus rex  — click here for more information), but only from fossils of “exceptional preservation” (preservation under very special circumstances that do not happen often). Therefore, molecular biology is mainly used to study the relationships among living species. Once the relationships between living species are understood, the characteristics of ancestral species can be inferred and confirmed through the fossil record. Schweitzer, M. H., J. L. Wittmeyer, J. R. Horner, and J. B. Toporski. 2005. Soft tissue vessels and cellular preservation in Tyrannosaurus rex. Science, 307: 1952-1955.